OSRAM HMI® UVS lamps provide high light intensity with UV emissions reduced by up to 99.9 %. These HMI® UVS lamps extend the life of fixture components while protecting film crews and talent from harmful ultra-violet radiation. 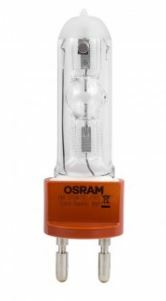 The HMI 575W/SEL UVS Osram 53979 is a Metal Halide 100V 575W Lamp with a G22 Medium Bipost base.